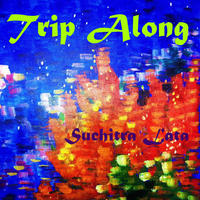 Suchitra Lata : Trip Along. Sophisticated electronica with sultry vocals; female, male and a choir, eclectic in its choice of languages, from English to French via Latin connected with ancient Indian poems (known as cheez in Hindustani classical music) and the hoary Dravidian tongue of Tamil, electronically filtered samples; this album explores musical textures from every angle and language! The ambiance also shifts in a pleasant kaleidoscopic array, from a happy monsoon welcoming song, to seductive love songs sung to a lover, some also to God, to metaphysical and linguistic contemplation on silence and words, to the grand Latin phrase "Veritas Vos Liberabit"! Step into a luxurious resort tucked away under the green fronds in a magical forest, or far out on in deep space, high above the clouds and the mist of a moonlit night, or simply deep inside the recesses of your heart and find yourself wafting peacefully into your zen lounge where you are always welcome! So, trip along!